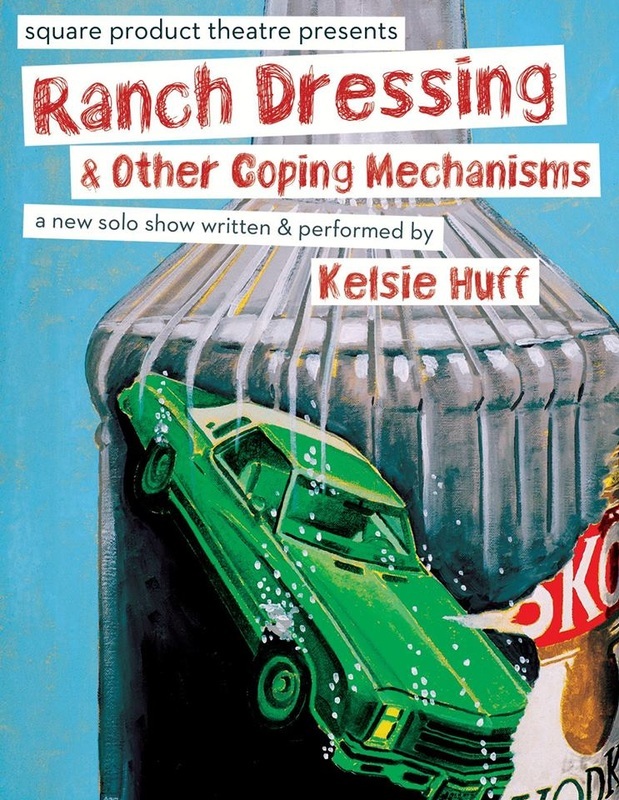 ﻿Ranch Dressing and Other Coping Mechanisms﻿ is the latest solo show from Chicago comedian Kelsie Huff. Ranch Dressing examines the absurd and painful complexities of wrestling with alcoholism. While hiding in a crusty toilet, Huff reflects upon her hilarious and troubled history with booze. Ranch Dressing follows Huff’s childhood struggles; from imaginary sharks in her childhood bathroom, to a violent Santa Claus - and builds to her adult anxieties such as colorful, tiny underwear and road trip games gone awry. Bouncing from past to present Huff’s trademark storytelling style leads the audience through a maze of loud mouth characters, insane family antics and raw revelations. Using her unique comic voice, Huff presents a world where vice is apart of life, violence is nonchalant, and the biggest challenge is accepting who you are. Huff owns this story. With a Sedaris-like attention to detail and a playfulness that’s infectious, she continually serves up the type of unexpected turns that smack of honest-to-God truth. "Huff pulls you in with wide-eyed physicality and razor-sharp focus. True to her best comedic forbears, she plays the absurd so pitch perfectly that when the climax arrives, it feels less like a major tonal shift than a revelation of something we knew was always just offstage. Undoubtedly, this show (wo)man is headed for an even bigger stage. DON’T MISS"
It's a darkly funny show that takes an unexpectedly poignat turn. "Her performance crackles with life and at its very best, gets into rare reaches of emotional ambiguity. Huff leads us into laughing and crying territory, but not in the Joni Mitchell way. More in a Bart-Simpson's-world-gone-bad kind of way." After last year's stellar "Huffs," Chicago's Kelsie Huff returns with another standout performance. "It starts with her stint in Girl Scouts, and ends at a church camp, where she and her Broadway musical-loving pal are harassed by the beautiful kids. Among the many gems we encounter are Huff's impressions of her Hostess-delivery-truck-driving Grandma, a visit to the roller rink, and the time she delivered payback to the (pretty) mean girls. Huff, who I think is a big-time talent, mixes a friendly Midwestern manner with a darker, slap-your-face-funny edge. They say the best comedy comes from painful places, and Huff is a fearless chronicler of the awkward and the excruciating, turning it into comic gold." Huff animates her 60-mintue solo show with an elastic face and a striking gaze... "the irises of her aquamarine eyes popping from the whites like double exclamation points...wicked sense of timing and knack for surprise." This is unflinching, thoughtful, and relentless self-reflection matched with master storytelling: poignant at times, yet always achingly funny. "Huff creates a cast of fully realized characters who are loveable, quirky, and hateful — sometimes, all three simultaneously." This show is hands down the best Fringe show I have seen this year. I laughed and laughed, and Kelsie’s ability to ad lib hilarious stuff based on interactions with the audience was mind blowing. I am still laughing at the steak knife and fork tattoo interaction. This is one funny lady and one funny show, and everyone should see it. I wish I had seen her shows in previous festivals because she’s awesome. Don’t miss out on your chance to see her. Imagine that your heart stops and all of your loved ones are hi-fiveing it to keep you alive. Is that so terrible? No, its a glorious miracle. This show is exactly the opposite of terrible. Completely hilarious and brilliant. Kelsie is crazy funny. I’m going back. For Real you guys! I almost peed my pants laughing so hard…. White Horse and Flower Power tattoos forever. She huffed and puffed and blew me away!! This woman is RAD! She has the strongest stage presence of anyone I’ve seen in a long time. Commanding the whole audiences attention the entire time, she dived deep into some intense topics but ALWAYS made the audience laugh with her incredible energy. COME SEE THIS PLAY! I'M OBSESSED! Kelsie Huff is a mixed bag of extraordinary talent. A truly high level theatrical show on every level. I believe this should win the Best of the overall Fringe shows. Kelsie is able to deliver the poignancy and humor of life stories, and lands every line, with a rhythm and pulse, that captivates the audience. Her writing and performance is personal and extends into our universal humanity. For two Fringes I have enjoyed Kelsie’s storytelling and have loved the journey she has taken us on every step of the way! My face was sore from laughing after seeing this show. Also has a really serious undertone at parts, while still maintaining the humor, which makes it really interesting and all the more relative. I loved it. When a brilliant child really pays attention, we get a Kelsie Huff. She is a midwestern intangible cultural asset. Rage on girl, you earned it!!!!! absolutely, positively, laugh-out-loud funny! Kelsie is a rock star, but better actually because you can relate to her! Keep on rockin it out girl! If you miss this show, well then you should kick yourself, several times!!! It’s terrible. Don’t go see it. That way I can get a seat every time! OMG! The Huff always brings it! I was cry/laughing at the “tourist/(won’t say, will leave as surprise)” scene she acts out. Kelsie is a true talent! But you knew that already. Kelsie is funny, effin’ (cue gasp) funny. This show differs from her earlier shows in that it does not lurch from poignant to side-splitting, but this supple stand-up show carries on with the Huff tradition in making ample use of self-deprecation, crazy family characters, and elastic facial expressions. As a one-time Chicagoan I loved her observations about life in that great city and audience zingers. If you don’t see this show you will be turned into a ferret. Long live the Pee Train!